With his dazzling displays, Iranian-born Mahan Esfahani is sweeping away the image of his instrument as an antique. If you buy only one record of harpsichord music in your life . . . buy this sensational album. The 30-year-old Iranian-American Mahan Esfahani has been making waves among connoisseurs for several years. Now he emerges as a superstar whose musicianship, imagination, virtuosity, cultural breadth and charisma far transcends the ivory tower in which the harpsichord has traditionally been placed . . . Where necessary, Esfahani is brilliantly accompanied by Concerto Köln. Even their final performance -- of JS Bach¿s Vivaldi-inspired harpsichord concerto in D Minor, with its plangently lyrical slow movement -- has a delicious twist. In the last movement Esfahani inserts a flamboyant cadenza by Brahms, of all people. A truly magical mash-up of times past, present and future. This collection of harpsichord pieces old and new shows Esfahani at his vibrant and expressive best . . . Esfahani proves that his instrument doesn't exist merely for music of olden times . . . Górecki's concerto is weirdly fascinating . . .
. . . sparky minimalist-baroque comparisons . . . [Concerto Köln]: robust yet elegant . . . [Reich / "Piano Phase"]: beguiling . . .
. . . virtuoso playing, both from Esfahani and Concerto Köln. A model recording for any instrument, not just the harpsichord . . . Exhaustingly brilliant. The fusion of old and new styles characterising harpsichordist Mahan Esfahani's DG debut unfolds with a sense of continuity and surprise . . . In the Scarlatti "La follia" Variations, for example, which Esfahani sails through with tasteful bravura . . . [Esfahani and company play with] energy and precision. Next up is CPE Bach's quirkily inventive "La folia" Variations, where Esfahani's subtle overlapping legato fingerwork and intuitive grasp of the composer's mood-swings are deeply impressive . . . the variations in the Geminiani Concerto (after Corelli's "La folia") stand out for textural clarity and suave tempo relationships . . . Esfahani's firmly centered articulation and rhythm make a plausible case for Steve Reich's "Piano Phase" as a harpsichord vehicle . . .
. . . [Esfahani's] playing is riveting throughout, terrifically dextrous, and occasionally even punkily agressive. It is certainly an extraordinary album, with plenty on it to fascinate . . . [Górecki's Harpsichord Concerto Op. 40] is brilliantly performed. Equally exciting is Steve Reich's "Piano Phase" . . . the Bach Harpsichord Concerto no. 1 in D minor is also splendidly played with the Concerto Köln. Less conventionally, it features rather a magnificent Brahms cadenza. The Geminiani Concerto Grosso is also excellent. A pair of interesting harpsichord CDs, including some great concertos . . . The young Iranian harpsichordist makes his DGG debut here with a typically adventurous mix of Baroque classics and minimalist masterpieces. The opening variations by his father show that Domencio Scarlatti wasn't the only famous harpsichordist in the family. The 8 1/2-minute harpsichord concerto by Goreki uses minimalist tendencies, but has a number of extra-musical dimensions that go beyond a mere celebration of sonorities. The 12-min. Geminiani concerto grosso has a rhythmic drive similar to what drew J.S. Bach to the concerto grossi of Vivaldi, and a fresh use of repetitive figurations . . . The CD closes with a magnificent performance of my favorite Bach concerto, the famous Bach Concerto for Harpsichord in d minor, with the Concerto Köln. 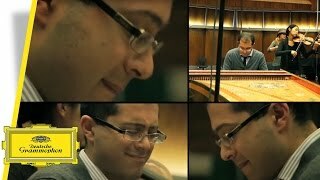 The Scarlatti is highly inventive and Mahan Esfahani's performance is brilliantly vivid, combining stupendous technique with a strong sense of character . . . The performance from Mahan Esfahani and the orchestra is stupendous . . . the sound world is vivid and energised throughout . . . He plays Bach's variations with verve, bringing excitement and character to the piece . . . [Geminiani / Concerto grosso in D minor]: After a grand and stately opening, we have playing of great character and brilliance, with rhythmic vitality . . . One of the beauties of Mahan Esfahani is his combination of superb technique with questing intelligence. Throughout this disc you feel him prodding and pushing the genre (and prodding and pushing us, the audience) to see where it takes him. 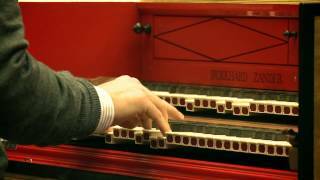 If you have ever wondered how the harpsichord could be brought into the contemporary era, then listen here. Esfahani breathes new life into these pieces . . . and as much as it is a true harpsichord work of art, the album is far from being stuck in a classical vein . . . the interpretations are outstanding. Magnificent, in fact.
. . . [there's more to Esfahani's time machine than mere juxtaposition . . . Three sets of variations on the "La Follia" theme exemplify the notion of patterning which is further teased out in the 20th-century minimalism Górecki 's fast-then-faster Concerto of 1980 . . . [on Steve Reich's seminal "Piano Phase for Two Pianos" Esfahani engineers] a richly ricocheting soundscape . . . Esfahani's pert perusal of Scarlatti's "Variation on 'La Follia'" [is laced with plenty of sly humour] . . . and his CPE Bach is eminently pliable, graced by ornaments turned with almost impossibly stylish elegance. Still, it's Papa Bach's bullish Concerto that steals the day, thanks to the sheer verve and bounce with which Mahan Esfahani juxtaposes works by Górecki and Bach Esfahani attacks its tightly-coiled "Sturm und Drang" . . . "Time Present and Time Past" sets up an engaging dialogue, and does it with vivacity to spare.
. . . one of the most absorbing recordings of a Reich phase composition that I have encountered over the last half century. Esfahani's technique in the Scarlatti is fearless as he applies speed and dexterity to showers of notes and deliciously rolled arpeggios . . . [Reich / "Piano Phase"]: Esfahani's precision makes a convincing case . . . the CD is intriguing . . . [Esfahani offers] a fresh take on an instrument still mistaken as hopelessly square. The player is learned, stylish, and bold. Virtuosic, too . . . From Esfahani's playing comes tremendous life or flash . . . [Reich / "Piano Phase"]: this performance is a feat of concentration and dexterity, and Esfahani's arrangement is impressive. "Time Present and Time Past" is an appealing disc . . .
. . . a beautifully phrased performance of Alessandro Scarlatti's (1660 -- 1725) "Variations on La Follia" with some lovely little varied rhythmic lines revealed with tremendous dexterity. Esfahani brings the music alive building a terrific forward momentum -- quite brilliant . . . [Reich / "Piano Phase"]: Esfahani's control and subtle articulation is very fine making the overlay of instrumental lines mesmerising. It is terrific how both the soloist and engineer have managed such incredibly accurate dubbing . . . Mahan Esfahani & Concerto Köln bring a superb performance of JS Bach's [Harpsichord Concerto] . . . to conclude this disc with Esfahani and the orchestra bringing a terrific rhythmic pulse to the Allegro. There are some terrific rich lower string sounds with Esfahani achieving some fine control of dynamics. The opening of the Adagio brings very fine sonorities from the strings of Concerto Köln before Esfahani enters bringing a lovely relaxed quality. There are lovely little decorations and a real dialogue between soloist and orchestra. This soloist brings superb musicianship, with Esfahani showing a freedom of expression as he weaves around the theme. The Allegro brings a burst of energy from Concerto Köln with Esfahani joining in a light and sparkling, infectious performance, again with terrific dialogue and interplay between soloist and orchestra. Later Esfahani delivers a brilliant solo harpsichord passage stunningly played. With this power, energy, poetry and sheer musicianship I found myself wanting more Bach. As well as juxtaposing baroque and minimalist works this new disc acts as a fine showcase for Esfahani's fabulous technique, musicianship and versatility. Sets of variations by C.P.E. Bach and Alessandro Scarlatti on the Baroque hit tune "La Folia" are highlights, as is Polish modernist Henryk Górecki's motoric, moving Harpsichord Concerto . . . Esfahani's twenty-first century vision for his instrument is singular. Esfahani stretches harpsichord's era from then to now . 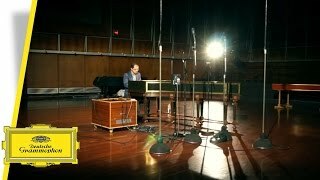 . . Mahan Esfahani is a terrific harpsichordist with a beautiful touch and technique to burn . . . [he is] making a harpsichord sound like a contemporary instrument thoroughly in tune with the now as well as an ambassador from the past . . . The line on Deutsche Grammophon's heretofore early-music-baroque-classical Archiv Produktion label will never be the same in the wake of this refreshingly bold issue. This first release showcases his colorful, songful playing and innovative programming . . . the mix somehow illuminates the disparate music. To my ears, "Piano Phase" works much better for two harpsichords than it did in the original two-piano version due to the nature of the instruments. It's sharper, clearer, brighter, and an even more startling experience than Reich probably imagined it could be . . .
Mahan Esfahani spielt Neues wie Altes als ein feuriger Improvisator: Das ist das schönste Plädoyer fürs Cembalo seit langer Zeit. Die Furchtlosigkeit, die er immer wieder als eines seiner künstlerischen Ziele betont, wird hier hörbar, in Form rüstiger Tempi und durch seinen Anschlag. Esfahani spielt mit Verve und Umsicht, er arbeitet mit Pinzette und mit Bizeps. Seine Klänge kennen zierliche Verläufe wie unter dem Mikroskop, aber auch füllige Substanz.
. . . [ce CD] se présente comme une carte de visite démontrant les riches capacités du claviériste iranien Mahan Esfahani. C'est aussi un programme habilement concu . . . [Geminiani]: toute l'onctuosité affûtée du Concerto Köln imprime un geste qui sait être à la fois caractérisé et flexible, d'où jaillit comme une diaprure complémentaire, le jeu toute en intelligence du claveciniste. Ce sont 11mn de haute virtuosité portées par un collectif cohérent, impétueux, d'une humeur chorégraphique et nostalgique délectable . . . [J.S. Bach / Harpsichord Concerto no. 1 BWV 1052]: évidemment, le Concerto Köln, badin, précis, mordant, flexible là aussi excelle dans un répertoire qu'il maîtrise intuitivement . . . On s'incline devant l'intelligence du programme et l'assurance du tempérament de Mahan Esfahani, son regard reconstruit, original sur l'instrument. Dans une période où règnent le superficiel et la culture jettable, les programmes aussi parfaitement ficelés et mûris, captivent, enchantent, convainquent. Mahan Esfahani, s'il a mille idées, excellentes pour la plupart, et toutes dominées techniquement . . . sa concentration amère est bien celle d'un maître. La cadence de Brahms tombe impeccablement dans les plis du finale de Bach. Le concerto referme un programme inventif . . . [le grand clavecin] révèle aussi efficace dans la déclamation volubile d'Alessandro Scarlatti que dans les assauts martelés de Górecki. "Piano Phase" commence en coup d'éclat: Esfahani s'approprie en "rerecording" le précis minimaliste de Steve Reich. Le déphasage progressif des motifs superposés est d'abord stupéfiant par l'attaque propre au clavecin.